An order from the town of Jupiter is shown in the front window of the Orchids of Asia Day Spa in Jupiter, Fla., Feb. 22, 2019. Twenty years ago, Yang Li left northeast China in the prime of her life and crossed the Pacific Ocean borne by her own American dream. She became an American citizen, founded a spa and massage business in Florida, participated in community activities, attended events where American politicians appeared, and posted on social media photos of herself with U.S. President Donald Trump. That photo opportunity ignited a media firestorm around Yang amid accusations that she sold Chinese businessmen access to American politicians, actions that may have violated the U.S. campaign finance laws. Yang’s name surfaced in the U.S. media March 8. That was days after police in Florida filed charges against Robert Kraft, the owner of American football’s New England Patriots, on Feb. 22, over allegations that he was soliciting prostitution at the Orchids of Asia Day Spa in Jupiter, Florida. Kraft has pleaded not guilty to the charges. Yang told NBC News on March 20 that she sold the spa seven years ago. At the time Kraft was charged, Yang ran a public relations business that provided opportunities for Chinese businessmen to have access to Trump at his Florida hotel and golf course. Yang’s company, GY US Investments LLC, also helped U.S. firms “expand their brand image in the modern Chinese marketplace.” Although the GY US website is down, the business remains open, according to public records in Palm Beach County. The Miami Herald reported a trail of campaign donations to Trump funneled by Yang through family, her work, and business associates. Yang told NBC News she does not know Trump despite the selfie she posted after a Super Bowl football championship party Feb. 3 at Trump’s West Palm Beach golf club. 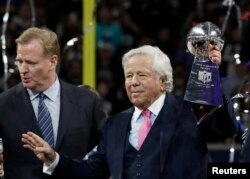 FILE - New England Patriots owner Robert Kraft celebrates with the Vince Lombardi Trophy after winning Super Bowl LIII, Feb. 3, 2019, in Atlanta, Ga. But media speculation about her ties to the Chinese government has dogged Yang since the days after Kraft was charged, as have suggestions that she may be a spy. The result is that Democratic leadership in both houses of Congress have asked the FBI to launch criminal and anti-espionage investigations into Yang’s businesses and activities. Yang, 45, has in turn used the media to say the American institutions she has long cherished are unfairly targeting her. She has scoffed at the spy charges and said she had never been involved with prostitution and did not violate any laws when she brought guests to Trump events. Yang took the English name Cindy, an homage to the American supermodel turned businesswoman, Cindy Crawford. “I like her,” Yang told NBC News. Yang has worked as a journalist, ran a media company and an art promotion agency, sold medical supplies, and worked in the spa/massage industry long before entering the American political fray. Through Yang’s lawyer, Voice of America has requested the opportunity to interview Yang. Although no decision has been reached, the invitation remains open. Yang was active in Chinese political and social circles in South Florida. Yang served as president of the Florida branch of the Chinese Cheongsam Association, which celebrates the traditional form-fitting Chinese dress, also known as a qipao. On the website of her consulting company, Yang said she was vice president of the Miami branch of the Chinese Association for Science and Technology, USA. The association was established in 2016. According to Chinese media reports, Yang participated in the local chapter of the Council for the Promotion of the Peaceful Reunification of China (CPPRC), which was founded in 2016. The organization is believed to have close ties to Beijing. Yang also set up a non-governmental organization, the Women’s Charity Foundation, in 2015. Outside southern Florida, Yang wasn’t a public figure until she became national news. Cliff Zhonggang Li, executive director of the National Committee of Asian American Republicans (Asian GOP) has worked with Yang. Li Zhonggang first met Yang at a May 2015 cheongsam association event she had organized. In the midst of founding the Asian GOP, Li Zhonggang pegged Yang as a people person with organizational skills. “I thought it would be very good if her energy could help us to promote Chinese-American political participation,” Li Zhonggang said. FILE - Republican presidential candidate former Florida Gov. Jeb Bush speaks at a campaign event in Portsmouth, N.H., Feb. 8, 2016. Yang helped mobilize more than 200 Chinese-Americans to attend a June 15 rally where Jeb Bush announced his candidacy for president. Asian GOP supporters occupied VIP seats as the group made its debut. At other Republican Party events, Yang met Karyn Turk, who was Mrs. Florida 2016, a conservative commentator and a radio host. Li Zhonggang said that after the Bush rally, Yang volunteered to be a fundraiser for the Asian GOP and act as an outreach director for its Florida chapter. Now Karyn Turk, and her husband, Evan Turk, are respectively Yang’s spokesperson and lawyer, helping Yang deal with what Karyn Turk calls “another media hype.” Li Zhonggang believes that a media “witch hunt” targeting Trump ensnared an innocent Yang. The Turks and others who know Yang told VOA she has become caught in a web of negative exposure and false speculation. American political insiders say it’s not difficult to make contact with Trump, or other politicians, and that people who are politically active or who make donations, often have opportunities to meet high-ranking officials. However, Li Zhonggang, of the Asian GOP, said some Chinese-Americans use photo ops with political figures to improve their visibility in the community as a way of making money for themselves. 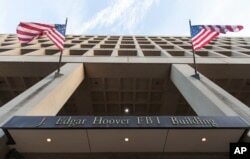 The Pennsylvania Avenue entrance of the J. Edgar Hoover Federal Bureau of Investigations (FBI) Building is seen in Washington, Nov. 30, 2017. Democratic leaders, including House Speaker Nancy Pelosi and Senate Minority Leader Chuck Schumer, asked FBI Director Christopher Wray last week to launch a criminal and counterintelligence investigation into Yang. The FBI has not commented. Yang’s attorney, Evan Turk, said his client’s reputation had been damaged and she is another Trump supporter who’s become a media casualty.